Such a talented and beautiful lady!! I got a smile and a nod from Alex at one of the concerts but I can't remember which one-- but a great memory it is!! 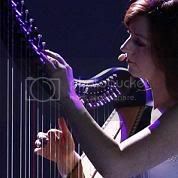 She IS a Celtic Woman, on and off stage. I'm so glad she joined the group. I believe that was in Chicago, Gary. You were in the front row,next to me, and you kept telling Alex " Way to go" !! LOL I don't know who enjoyed your enthusiasm more..Alex or your forum buddies around you! "We create our tomorrows by what we dream today"
Thanks Hayley for the great banner!! You're right, Zee!! I loved that concert!! It was just great to be able to look into their eyes when they finished and tell them how wonderful it was for all of us! Do ya really think they noticed I enjoyed the show? ? ? Smile, you never know who's watching. They would have to be blind to not notice, and even then I think they would have heard your excitement! Happy is what happens, when all your dreams come true! I must say that I am an Andrew Lloyd Webber fan but never heard of "The Beautiful Game" - can someone fill us in on the plot? I don't if it's the good place a moderator can move this topic if it's necessary. "I bless you... and you bless me too." Thanks Marc, I did enjoy! Of courses whatever Alex does is great. Wow! I barely recognized Alex. Her voice has changed quite a bit, but it was still as amazing as it was during the spring tour. Thanks for sharing the links, Marc! That link didn't help because it was deleted, due to some inaccurate information. "The Beautiful Game" is set in Belfast, Northern Ireland, which was a very dangerous place in the 1970s. It is about young people, some Catholic, some Protestant, trying to live a normal life and enjoy soccer. However, sectarian violence raises it's ugly head, and inevitably results in tragedy. Thanks for that updated link,Maggie!